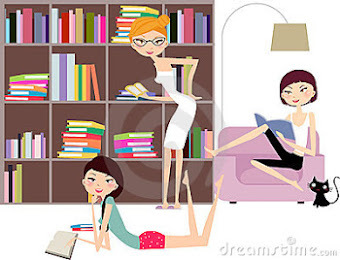 We are chicks who love to read and love to dish about the books we read. We may be just a little obsessed, but let's keep that our little secret. Our tastes in books may differ, but we share a love for reading. But we can all agree that we love romance and literature of all types. Here is a little something about each of us. Hi my name is Jen and I was never big on reading. Once I met Christian Grey that certainly changed. I read Fifty to see what all the hype was about and ever since then I have become a reading addict. I am a stay at home mom with three kids. Taking care of 3 kids, a home and a husband reading helps keep me sane. Those hours while I am reading I am in my own fantasy world with my book boyfriend, who changes with each book of course. I am a passionate reader who is always chasing the happily ever after. From my very first Nancy Drew story (which I read under my covers with my Girl Scout flashlight) I have loved reading. Romance books, whether adult or YA, are my personal preference. In my spare time (lol), I have been fortunate enough to be an ARC/Beta reader for some amazing authors! My mantra is "A book a day, keeps the blues away." Hi! My name is Jennifer. I have always been a reader but during the college/raising young children years I did not have the time to pursue my love of reading. Once I found the time to read 50 Shades I decided I had been missing out on too much of the fictional romance. I bought a Kindle and found my long-lost passion for reading. Romance filled with angst is my personal favorite and I love finding a good book that is not known by many and can share the review with others. When I’m not reading I am busy being a stay-at-home mom to my 3 crazy kids and helping my husband on the farm. You've been nominated for a Leibster Blog Award! Check it out! It is my pleasure to write here for you to see if you could write something about our DesignEvo on your site. * 4000+ professionally designed templates. If you are interested, please feel free to ask me for the coupon to get its premium logo package for free.